A sixteen-year-old boy imprisoned for bringing milk to nationalist rebels hiding in the forest. Gopchik’s adult sentence to serve in the Gulag despite his status as a child depicts the unyielding tyranny and lack of compassion of the Soviet regime. Gopchik is still innocent, and has not yet been hardened by life in the Gulag, but like Shukhov, he is resourceful and hard working. Shukhov is fond of Gopchik because of these traits, and knows Gopchik will make a good prisoner in time. Gopchik also reminds Shukhov of his own son, who died young, and can viewed as a representation of Shukhov as a younger man. 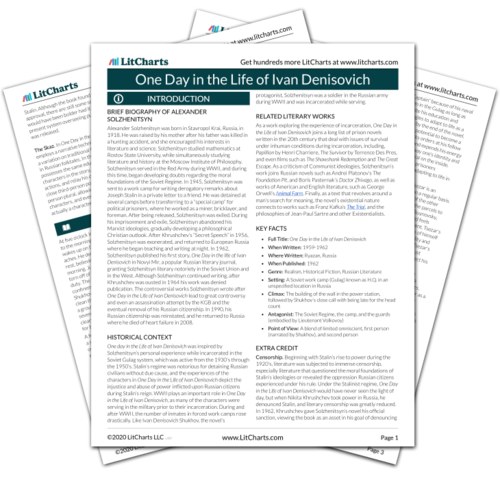 The timeline below shows where the character Gopchik appears in One Day in the Life of Ivan Denisovich. The colored dots and icons indicate which themes are associated with that appearance. Powers, Jacob. "One Day in the Life of Ivan Denisovich Characters: Gopchik." LitCharts. LitCharts LLC, 9 Feb 2014. Web. 18 Apr 2019. Powers, Jacob. "One Day in the Life of Ivan Denisovich Characters: Gopchik." LitCharts LLC, February 9, 2014. 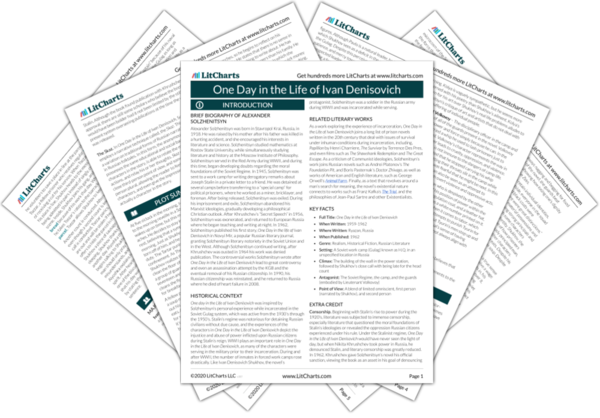 Retrieved April 18, 2019. https://www.litcharts.com/lit/one-day-in-the-life-of-ivan-denisovich/characters/gopchik.